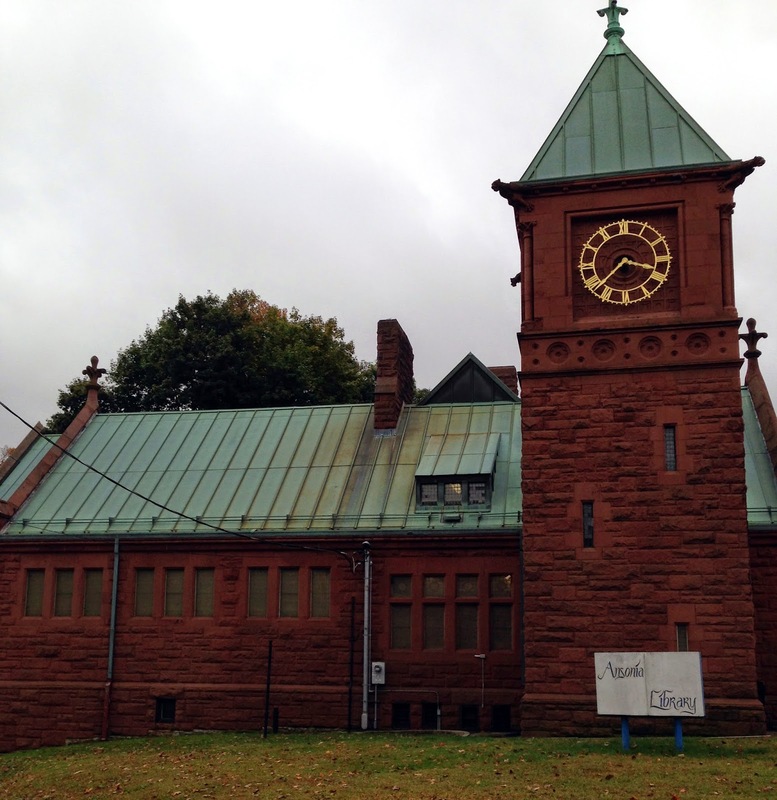 The Ansonia Library was the first stop in my recent research trip in Connecticut to find the children of Thomas Brady & Catherine Gibney. When I parked near the large stone building I had no idea what I might find inside. The website did not reveal their genealogy & history holdings. I gathered my notes and my iPad and quickly walked through the rain and into the library. Construction of the building began in April, 1891. It was dedicated June 9, 1892, and became a library in 1896... 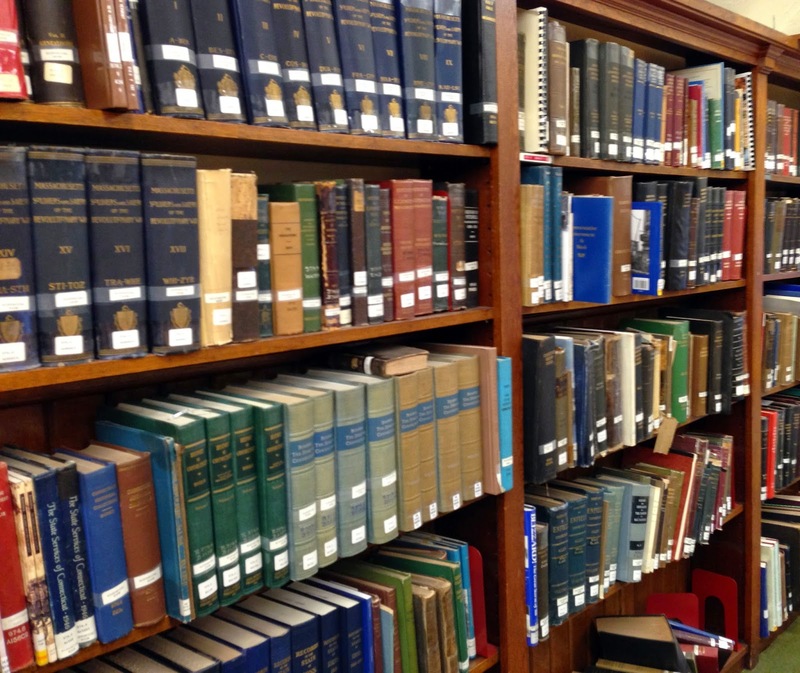 The library started with a collection of 1,515 books, and a circulation the first year of 31,512.
from: Molloy, Leo T. Tercentenary Pictorial and History of the Lower Naugatuck Valley. Ansonia, Connecticut: Press of the Emerson Bros., Inc., 1933. 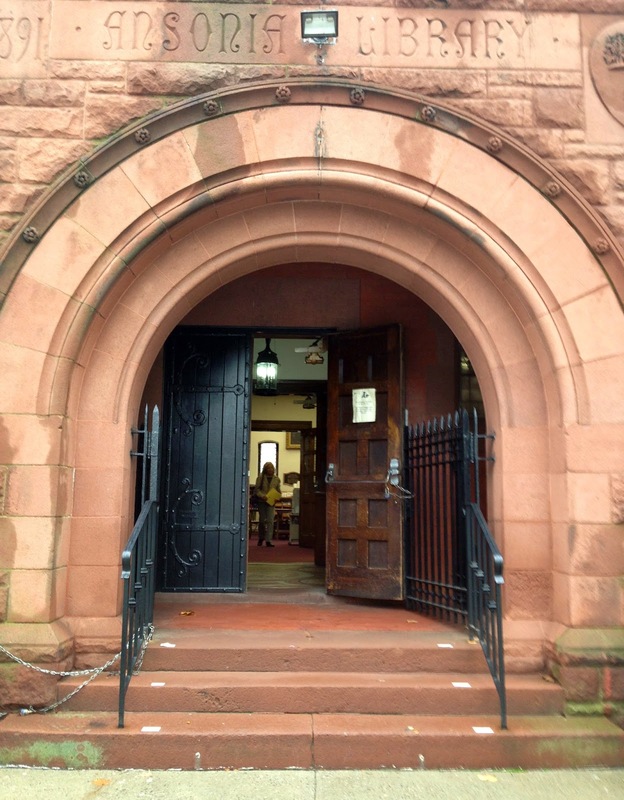 After speaking to the librarians I was given a key and directed up a narrow wooden staircase to the history room. 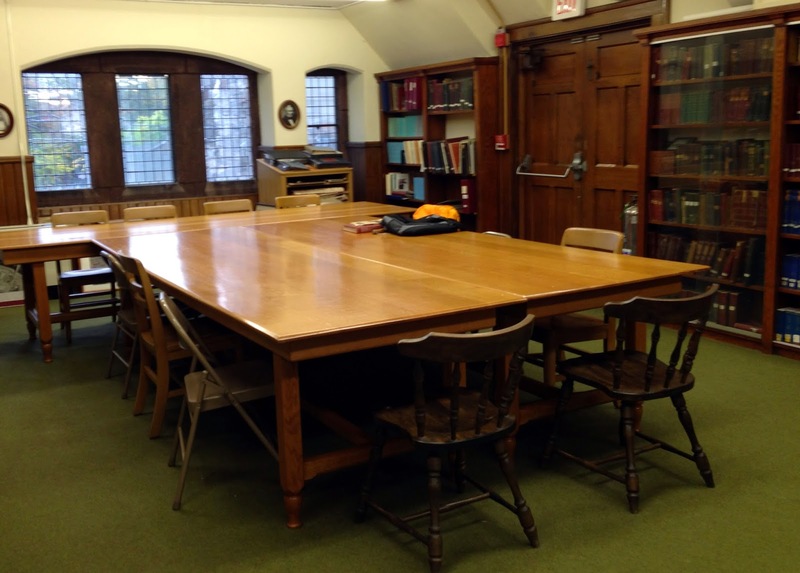 In the center of the room are large wooden tables. I set down all my things and hung my rain jacket over the back of a wooden chair. Then I walked around the room to discover just what was there. 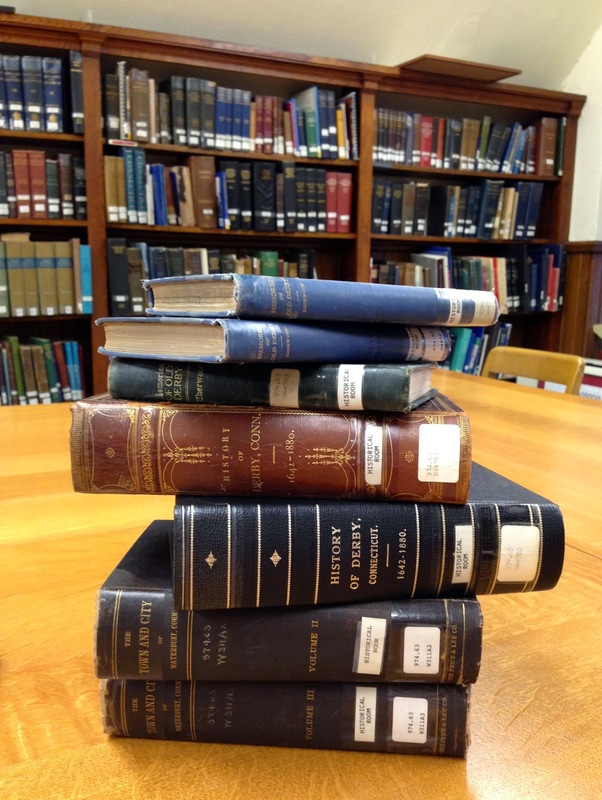 First I found books on the history of the state, neighboring states, counties in CT, and towns in those counties. I like to learn what was happening in the area where my ancestors lived so I gathered a few to look through. Most of the history books there are best for families who were in the area early. Our Irish Bradys did not arrive till the late 1800s. A book by Leo T. Molloy gave me information on the area with brief histories of the towns, the local newspaper, industries, churches & etc. It even gave a history of the library I was in. Molloy, Leo T. Tercentenary Pictorial and History of the Lower Naugatuck Valley. Ansonia, Connecticut: Press of the Emerson Bros., Inc., 1933. A collection of City Directories was my next useful discovery. 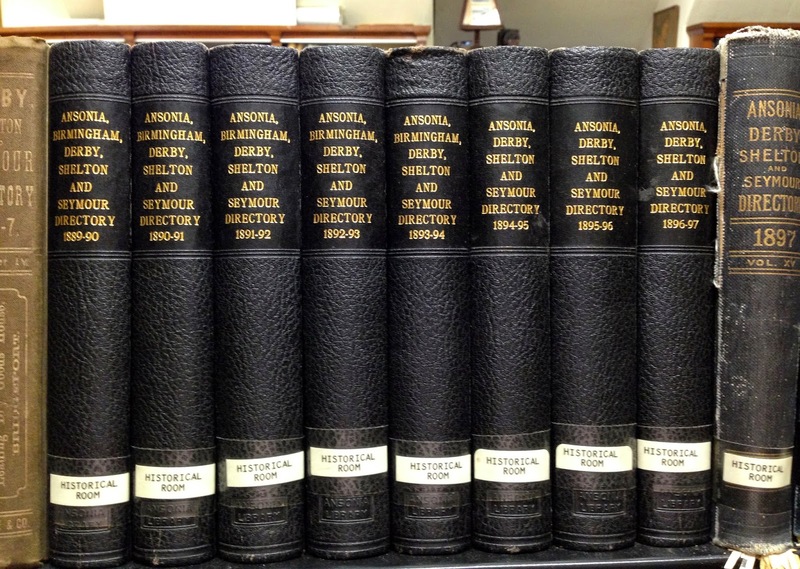 I found our family in those volumes for a period of over a hundred years. Ansonia, Birmingham, Derby, Shelton, Seymour Directory. New Haven, Connecticut: Price, Lee & Co., Publishers. By the time I was deep into taking notes from the directories my cousin arrived from NJ. She made her way up to the history room. We greeted each other with big hugs and then Pat had her turn to explore the room. During the weekend we headed off in other directions: the Derby Historical Society, Ansonia City Hall & cemeteries in the area. However, we kept returning to the library. After uncovering tombstones we had death dates in hand and we returned to the library to use the microfilms of the Ansonia Evening Sentinel and found many obituaries. We could have worked twice as fast if we each could have used a machine. However we had a nice pile of obituaries [and only 10 cents a copy] when we finished. Thanks to the librarians who retrieved the boxes of microfilm for us, gave us some driving directions and were always friendly. What a charming little library! Lisa, if I lived nearby I'd like to lead a fund raiser for that library. The history room needed attention and they had only one working microfilm reader. But it was full of hidden treasures. Beautiful old building; rich in history both outside and inside..
Charlie, I enjoyed sitting in the library and reading the history of the building.